We are a TRICARE Dental preferred provider and serving the city of Plantation and Fort Lauderdale. 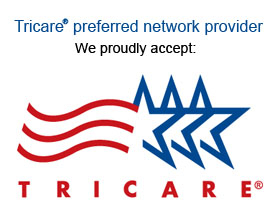 We are in-network with all TRICARE dental plans in Florida. If you have TRICARE Dental insurance benefits you may set up an appointment online or call Marria Sherman to help you set up an appointment over the phone. She would answer all related questions you may have about your specific dental coverage. The Tricare dental insurance program is available to active duty family members, members of selected reserves, family members of the selected reserves, individual of ready reserve, unmarried children under age 21 or age 23 if full time college student. To be illegible to enroll in the Tricare dental insurance the individual must be have at least twelve month on his or her service commitment at the time of enrollment. Selective dental services like root canal, extractions, crowns, dentures, mouthguard, gum surgery and dental implants are covered at 50% to 80%.